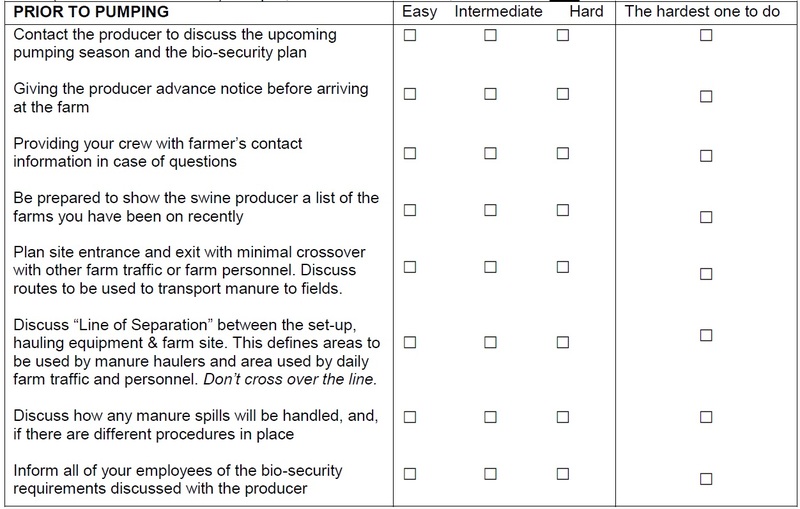 Pork Check-off, National Pork Board and the American Association of Swine Veterinarians have completed the following Swine Health Producer Guide “Bio-secure Manure Pumping Protocols for PED Control: Recommendations for Commercial Manure Haulers”. (Source: http://www.aasv.org/pedv/producer_hauling.pdf). The following questions are based on this document. The Protocol has three sections, ‘Prior to going to a site to pump’, ‘At the time of pumping’, and ‘After pumping’. This questionnaire follows this flow, with a set of questions about ‘Prior to pumping’, then ‘At the time of pumping’, and then finally, ‘After pumping’. Each of these three sets of protocols will ask you to respond to the same two questions. 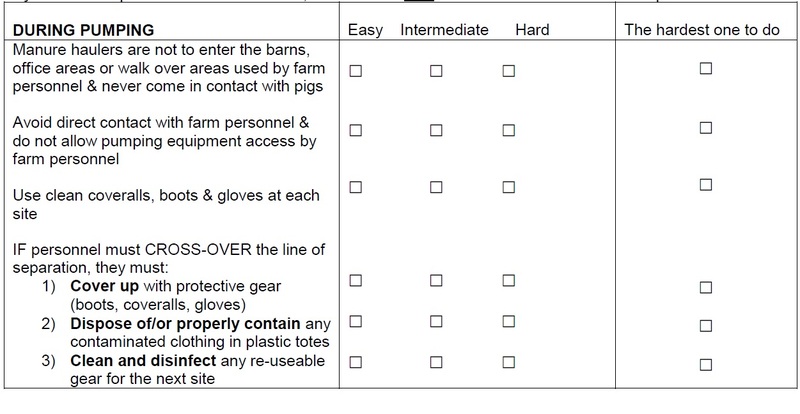 Prior to going to a site to pump, COMMUNICATE with the producer. Step 1 – rank each of the following as easy, intermediate OR hard to accomplish on a day-to-day basis. Step 2 in the LAST column, choose the one that is the hardest to accomplish.